Solid indoor hobby table with compact technology. Very easy to handle due to the safety locking system. 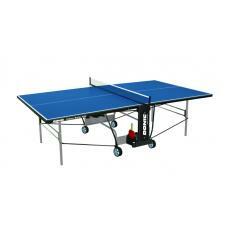 19 mm blue top with 36 mm metal frame all around the top guarantee good ball bounce and stability. Under carriage 25x25 mm square-type tube. The legs are strengthened by 2 metal supports. Fixed net and post set as well as storage place for bats and balls. Big 128 mm rubber wheels provide stability and easy manoeuvrability even on uneven ground. Playback position possible - you can play on your own.